Two bickering comrades embark on a journey with a chivalrous warrior and a pugnacious princess across a hostile landscape to transport a valuable bit of cargo that will ensure the survival of the princess’ domain. 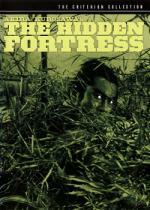 Although this scenario sounds strangely similar to a story set ‘in a galaxy far, far away’, its story is really set in medieval Japan and is the heart of Akira Kurosawa’s The Hidden Fortress. It is Kurosawa’s lightest film and can be best equated with the scores of adventurous serial films churned out by Hollywood in the 40’s and 50’s. Yet in the hands of a master storyteller and director, rises above the commonality of repetitive themes and acting styles. Rokurota Makabe (Toshiro Mifune) is a distinguished samurai general of the Akizuki clan whose armies have been defeated by their rivals, the Yamana clan. It is his task to transport Akizuki’s sole surviving monarch and a treasure of gold bars that will rekindle the flame of Akizuki power, to the sympathetic Hayakawa clan’s region. A price has been put on princess Yuki’s (Misa Uehara) head and Makabe is at odds in whom to trust in helping him successfully complete his mission. As he ponders the daunting task that lay before him, he meets two comical peasants (Minoru Chiaki & Kamatari Fujiwara) who have stumbled upon two pieces of the gold and are greedily searching for more. He convinces them that he knows the whereabouts of the remaining gold and in compensation for their assistance in transporting the gold to the Hayakawa region, will share it equally with them at the journey’s end. Successful in procuring the help needed to make the journey, he now turns to face his one last problem, inventing a ruse that will insure that the peasants do not reveal the princess’ identity. Makabe decides that the princess will feign deafness in hopes of hiding her refined speech and mannerisms, which would most certainly give her identity away. Over the course of the next few days, the greed of the two peasants will plant them into harrowing situations that will endanger the entire group. Only for the skill and wits of Makabe will they be spared the fate of death. As they travel on their perilous journey, princess Yuki witnesses the hardships her people are enduring to assure the restoration of the Akizuki reign. By the film’s end, the aristocratic and detached demeanor that permeates her personality will soften to renew in her an aura of humanity that will forge a great leader of the re-born clan. By 1958, Akira Kurosawa had cemented his reputation in the cinema world as a force to be reckoned with. After making the classics, Shichinin no samurai, Ikiru, and Rashômon, his artistic vision would expand exponentially with the introduction of widescreen Cinemascope in Japan in 1958. By expanding the canvas upon which he created, Kurosawa would add a depth and dimension to his films that other directors of the time and in successive years would mine for inspiration. If you go into this film just trying to spot the similarities with Star Wars, you’ll find yourself disappointed. But if you can clear your mind of Lucas’ subtle stealing of the storyline, you’ll be rewarded with an entertaining adventure that not only will keep you on the edge of your seat, but will make you chuckle too.